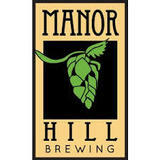 Kurt has been chomping at the bit to brew a Porter from the moment he walked through the doors at Manor Hill. His recipe was developed using rye and a wide variety of specialty dark malts. This full-bodied Imperial Porter displays a black body with a fluffy khaki head. Aromas of cocoa and coffee completely dominate the nose. The flavor profile is moderately sweet with waves of roasted malt character and a hint of spice in the finish.